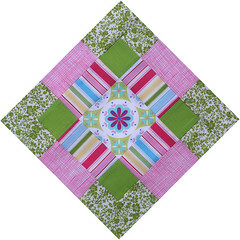 Updated on 8/9/11: Download all nine blocks from the hop on the Aurifil website. Admission: I never really cared what type of thread I used. OK, stop cringing. I’m a color gal and I just never gave it much thought. Ah Ha! : That would be the moment I wound my bobbin with 50 wt Aurifil cotton thread and began piecing my Blossom Block (one of 9 blocks you’ll be able to download for free on this hop!) The light footprint of my stitches resulted in the most Accurate 1/4″ seam I’ve ever sewn and there was no thread bulk. You know I love pressing the heck out of my blocks and no bulk meant my block was flat as a pancake. Adore, Amazing, Absolute Best: A few of the descriptions from quilters I asked about Aurifil thread. Yes, I am definitely the last person to attend this party but I’m so glad I finally Arrived. I received a sample pack of Aurifil thread in different weights. I used the 50 wt cotton to piece my block and LOVED it. Smooth, lean, strong, and colorful. Not a bit of thread fuzz to be found anywhere around my bobbin case or presser foot. I was so completely Awestruck (yeah, a little over the top with the A‘s but that’s my letter!) with the 50 wt thread for piecing that I wanted to try the 28 wt to quilt something. I pieced my block into a Gather Up Pillow top, a great size to quickly test drive the thread. The results were spectacularly Awesome! Smooth stitches, excellent tension, and a natural sheen that makes the pillow top glow. 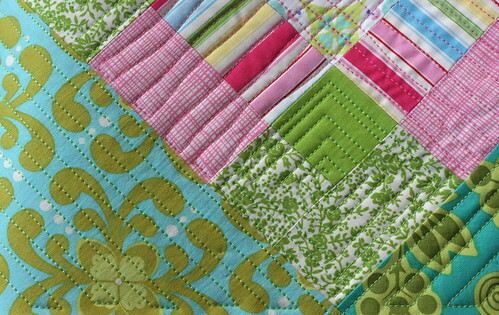 A note on my project: I used Brand X for the Pink stitching lines and Aurifil for the Green. A very noticeable difference! I can say with true sincerity this thread has knocked my socks off. I’m a total convert. 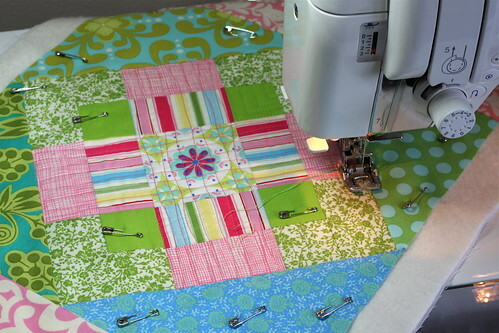 Pat Sloan is organizing the Aurifil Blog Hop so of course it’s loaded with all kinds of fun prizes and goodies. If you’ve used Aurifil Thread leave a comment sharing what you love about it. If you’re a thread newbie like me share why you’d like to experiment with Aurifil thread. Everyone is a Winner: Each stop on the blog tour features a 9″ quilt block pattern you can download. Pat designed the first block. She’ll be posting the final setting instructions (blocks are set on point) along with the winners of the drawings on her blog this Saturday (February 26) updated to: Monday, February 28. Good luck! I’ve designed the Blossom Block which can be downloaded here. 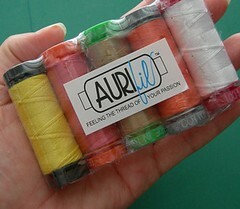 Sample Packs of 5 Aurifil Threads. Two winners will be selected from those leaving comments on this post. 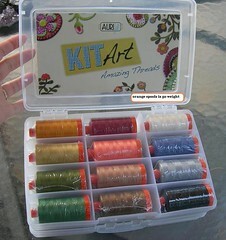 Grand Prize: A Pat Sloan Kit Art 50wt Aurifil Thread Set. Each stop on the blog hop will select one name to be entered into the Grand Prize drawing. * Pink Chalk Studio (Letter A) Kathy Mack – You’re Here !